Mango is like Prozac for salads. The sweet and juicy fruit adds a bright kick to any bowl of greens. Watch this week’s episode of Mad Genius Tips to learn how to peel a mango using a glass, then try one of these terrific recipes. Salty country ham is incredible with sweet, fresh mango. This fun and easy twist on a classic tomato-basil salad gets extra sweetness from mangoes and a briny kick from crumbled feta. 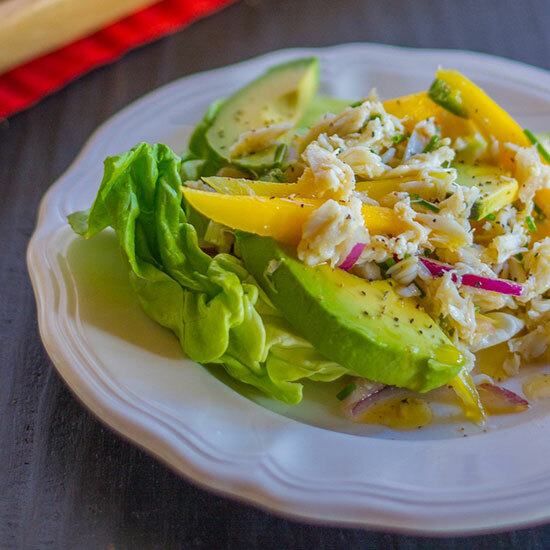 Invented in 1953 to honor the crowning of Queen Elizabeth II, this sweet-tangy curried chicken salad is tossed with juicy mango and crunchy almonds. The crunchy jicama and the soft, sweet mango provide lively counterpoints to the shrimp in both flavor and texture. This bright and fresh salad is dressed with a spicy-tangy lime-jalapeño vinaigrette. This salad gets its amazing flavor from fish sauce, rice vinegar and chili-garlic sauce. Butter lettuce wraps are a great vehicle for this sweet and salty salad, but it can also be served on a bed of torn lettuce leaves. Chef Jean-Georges Vongerichten dresses plump tomatoes and mango slices with red wine vinegar, just a little olive oil and plenty of sliced fresh basil. This super-fast salad is a great way to use leftover roast chicken. Mango and avocado both have an affinity for cilantro. Here, the herb ties them together in an unusually delicious way.